Whether you use it as your workstation or your battle station, the ARCTIC Z1 monitor arm is the tool you need to keep your desk clutter free, allowing you to increase productivity and level up your gaming. If you spend a lot of time in front of the screen, you'll quickly come to appreciate the ergonomic advantages of the Z1, especially the ability to customize your viewing angle. Finding the optimal setting for your screens improves your posture. Whether you want to adjust the height, angle or screen orientation, the Z1 enhances the ergonomic capabilities of your desk and office chair, offering you comfort and adaptability. 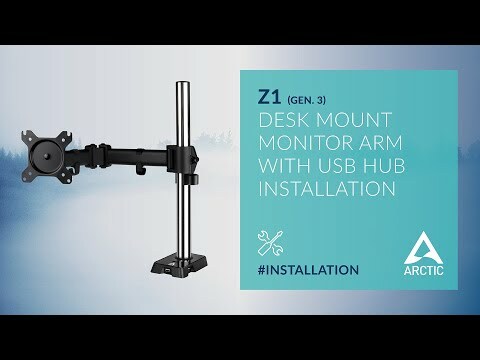 The ARCTIC Z1 monitor arm supports the latest ultrawide monitors (up to 49 inches) with ease. Classic 16:9 monitors are also compatible (up to 43 inches). The Z1 supports a total load of 15 kg/33 lbs. The mounting head of the ARCTIC Z1 makes installation and subsequent alignment changes uncomplicated and easy to manage. It doesn't matter if you want to slightly tilt your monitor or turn it 180 degrees - the only tools you need are your hands. The stylish 2.0 USB hub brings four ports directly where you need them most - on your desk. Sick of cable clutter? With the Z1's included cable management, unruly cables are a thing of the past. With just a few simple steps and the included tools, the Z1 is ready to use at your table in no time.